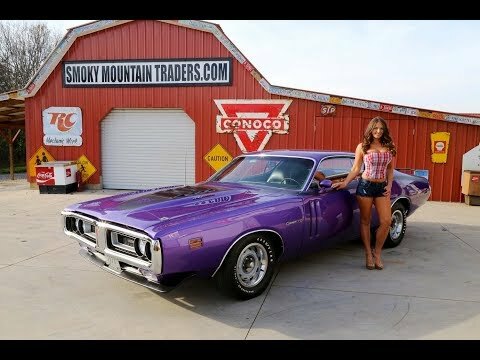 Up for sale we have a 1971 Dodge Charger R/T. This is a gorgeous car that has had a complete Rotisserie Restoration. It also comes with multiple Build Sheets and documentation. This Charger features the Matching Numbers 440 and is a factory Four Speed and A33 Track pak car. From first glance you're sure to be impressed with the body as it has beautiful lines from front to back. All the panels have and excellent fit along with all of the gaps being symmetrical. When restored it was pulled part for paint. Everything is covered in the Plum Crazy Purple that has been buffed and polished to a gorgeous shine that's slick as a ribbon. It's accented by the Black Inlay on the raised hood along with the Black side stripe. All the chrome and stainless on this '71 appears to have been replaced and is still like new. Also, the glass appears to have all been replaced along with new seals and weather stripping. To finish off the look it's sitting on a set of factory style Rallyes with Goodyear Polyglass G60 15 Tires. On the inside it's done in the classic black that flows perfectly with the exterior color scheme. It does come with Bucket Seats and Console with woodgrain trim, and yes the Pistol Grip shifter. All the seat covers appear to have been replaced along with the padding. Looking at the door panels they also have the wood grain accent are in great condition. As for the dash, it's also in great condition and has the working gauges. The factory style radio is also working along with the horn, emergency brake, and wipers. Inside the trunk you will notice it's just as nice as the exterior and comes with jack, spare, and trunk mat. Under the hood is stunning and features the matching numbers 440 Block. It's mated to the Four Speed Trans and Dana 60 Rear End with the Sure Grip 3.54 Gear. The 440 is set up with the correct '71 model intake and a Carter Four Barrel. It's dressed in the factory style valve covers and breather. The exhaust flows through manifolds with new dual pipes and factory style mufflers. This Charger comes with Power Brakes, that have had new lines installed, along with Power Steering. Under the front you'll notice everything looks to have been replaced from Ball Joints to end link bushings. Also, a new gas tank was installed, and the lines were replaced as well. We are very impressed with how amazing the bottom of this car. Everything has a beautiful detail featuring the body color frame and floors. But more impressive is how rock solid everything appears. You can tell this was a phenomenal car before the restoration processes was ever started. The closer you look, the more impressive it is.